Where do I use my P and O Ferries voucher code? On the left-hand side of the page, it will ask for details of your cruise or ferry to get a quote. At the bottom, above the 'Get Quote' button is a box to enter your promo code. Enter your code here and click 'Get Quote'. Your discount or offer will automatically be processed or deducted in your quote. Check out the offers section for each available route, before booking and before sailing, to see special fares and any current onboard savings you can take advantage of. If you plan on 3 or more return trips within a 12 month period then it would be a good idea to get a season ticket for the best rates and flexibility of travel. Feel like seeing somewhere new, but don’t want to pay for a plane ticket? Why not travel the seas aboard a P&O Ferry? Whether it’s a short trip, a mini-cruise or the first leg of a European journey, routes to France, Belgium, the Netherlands, and Ireland will take you across the water in comfort. Each of P&O’s world-class ferries is complete with the full array of onboard amenities and facilities, with a variety of greatly discounted shopping opportunities, restaurants, children’s play areas, foreign currency exchange, entertainment and more to make your passage as pleasant as can be. P&O will help you with AA travel insurance and European breakdown cover, to give you peace of mind should something unexpected occur. They can even help you pick accommodation, should you be looking for somewhere to stay overnight. On board every ship and ferry from P&O you can expect excellent facilities and uncompromising commitment to professionalism, for which they are renowned. P&O’ fleet of ships epitomises the best of modern British cruising and offers an unrivaled boating experience. On board every ship and ferry you’ll enjoy exceptional service and attention to detail, delicious cuisine and outstanding entertainment. With a large fleet of cruise ships and ferries, P&O can take you practically anywhere you want to go, and they do so in style and comfort. On board they’re are so many features and things to do that you’ll completely forget you're on board a boat, except of course when you go outside and witness the staggering views of the sea you're cruising across. With P&O you can find all the comforts of home on board plus some added luxuries to make your travelling that extra bit special. 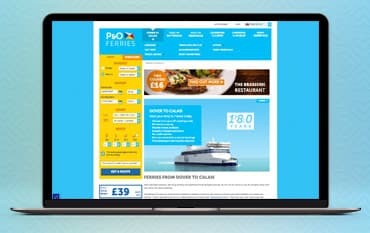 P&O Ferries is a household name operator of ferry services across the English Channel, the North Sea and the Irish Sea. P&O have a fleet of more than 20 ships, operating more than 30,000 sailing a year, in addition to sailing on eight major routes between Britain, France, Northern Ireland, the Republic of Ireland, Holland and Belgium. Every year ferries from P&O safely and successfully carry more than 10 million passengers, 1.6 million cars and 2.2 million freight units across the water, making them the ‘best ferry company’ as voted for by consumers in the 2016 Globe Travel Awards. With North Sea Ferries you can travel to Rotterdam, Zeebrugge or Amsterdam, departing from the docks at Hull. From Hull to Rotterdam you can expect extensive onboard entertainment on your overnight stay, cabin accommodation included in the price, dining and cabin packages available and no credit card free when completing your booking. Whilst onboard you can enjoy the casino, cinema and shops, the La Brasserie restaurant and the outdoor spaces, where you can enjoy the horizon between your two destinations. On ferries from Hull to Zeebrugge and Amsterdam, you can also expect the same kind of onboard facilities and impeccable service from P&O North Sea Ferries. Will my passport need to have more than 6 months validity when I travel? No, you can still travel if your passport has less than 6 month validity as long as it will still be in date for your return journey. Am I able to pre-book any meals before I travel? This option is available on selected routes in selected restaurants only. If this option is available on your chosen route, during the booking process you will see an option to pre-book any meals, by pre booking you can save up to 10% as well. How can I find the latest sailing and traffic updates? You can following the Twitter feed of P&O Ferries, which has regular updates on it. Also we recommend you provide a mobile number when booking, as where possible you can receive a text with updates on. P and O Ferries transport vehicles and passengers and their pets, from Dover to Calais, Hull to Rotterdam, Hull to Zeebrugge, Troon to Larne, Cairnryan to Larne and Liverpool to Dublin. They have regular offers on all of their routes and on board retail offers. It is also possible to book hotels and tickets for Disneyland Paris from their website. We are constantly on the hunt for Promo Codes for P and O Ferries to help you with your money saving. Our experts check dozens of sites for secret codes including NHS discounts, student sites & social media channels saving you time & money!